Watch this space for further updates as we progress. And most importantly of all, please get in touch if you want to help! Our first-ever community-based survey. See the press release (with video and pictures), a picture album and the data. Ali Saleh Ibrahim and Waleed Alkaabi conducted this survey as a two-man team! See a picture album and the data. Our third community-based survey, which coincided with the launch of Reef Check Oman and the announcements of some partnerships. See the press release, a picture album and the survey data with some pictures. 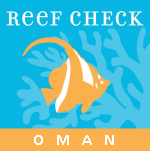 Reef Check Oman is a reef conservation and research NGO based in Oman.